The ultimate symbol of love, beauty, truth and elegance, the diamond has been revered for its rarity and absolute brilliance for centuries. The ideal gift for a loved one, especially this month, the diamond holds a unique and powerful magic; one that enchants as well as delights all that look upon it. Emma Watson, widely known for her role as Hermione Granger from Harry Potter, shares her birthday with many this month. With sophisticated and elegant award ceremonies, red carpet events and movie premieres to attend, she is constantly wearing gorgeous diamond jewellery designed to impress her co-stars, public and fans. Diamonds are world-renowned for their broad colour range, high refraction, high dispersion or fire, their rarity and durability. If you are looking for the perfect gift this month, the diamond gemstone is sure to leave her speechless. A symbol of purity and innocence, it is often considered a lucky gemstone that enhances the wearer’s beauty and radiance. Not only the birthstone for April, the diamond is also the stone traditionally given for 60 years of marriage, which elegantly captures the essence of a love that is strong, unyielding and everlasting. In early history, diamonds were utilised to engrave tools because of their superior hardness, until slowly they became more revered for their sophisticated beauty that speaks an untold brilliance. At Kennedy Jewellers, we ethically source all our diamonds and ensure they meet our strict criteria before combining them with precious metals to create unique, intuitive and beautiful jewellery pieces. 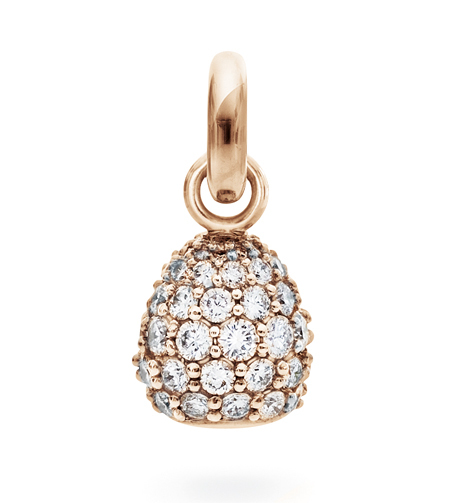 Discover the true brilliance of diamonds with our sweet drop charm, set in 18ct rose gold with a diamond set at every angle. Reflect your inner beauty and radiate with a sophisticated glow for years to come with this sweet, luminous and resplendent necklace charm. One of the world’s most cherished gemstones that come in a wide range of hues and intensities, at Kennedy Jewellers, our Master Jewellers are dedicated to creating truly elegant and unique pieces designed for absolute beauty. With a complete collection of diamond jewellery and loose stones, we are able to tailor our pieces to meet your needs.